Rice University scientists have constructed the world's smallest car - a single molecule "nanocar" that contains a chassis, axles and four buckyball wheels. The "nanocar" is described in a research paper that is available online and due to appear in an upcoming issue of the journal Nano Letters. "The synthesis and testing of nanocars and other molecular machines is providing critical insight in our investigations of bottom-up molecular manufacturing," said one of the two lead researchers, James M. Tour, the Chao Professor of Chemistry, professor of mechanical engineering and materials science and professor of computer science. "We'd eventually like to move objects and do work in a controlled fashion on the molecular scale, and these vehicles are great test beds for that. They¹re helping us learn the ground rules." The nanocar consists of a chassis and axles made of well-defined organic groups with pivoting suspension and freely rotating axles. The wheels are buckyballs, spheres of pure carbon containing 60 atoms apiece. The entire car measures just 3-4 nanometers across, making it slightly wider than a strand of DNA. A human hair, by comparison, is about 80,000 nanometers in diameter. Other research groups have created nanoscale objects that are shaped like automobiles, but study co-author Kevin F. Kelly, assistant professor of electrical and computer engineering, said Rice's vehicle is the first that actually functions like a car, rolling on four wheels in a direction perpendicular to its axles. Kelly and his group, experts in scanning tunneling microscopy (STM), provided the measurements and experimental evidence that verified the rolling movement. "It's fairly easy to build nanoscale objects that slide around on a surface," Kelly said. "Proving that we were rolling ­ not slipping and sliding ­ was one of the most difficult parts of this project." To do that, Kelly and graduate student Andrew Osgood measured the movement of the nanocars across a gold surface. At room temperature, strong electrical bonds hold the buckyball wheels tightly against the gold, but heating to about 200 degrees Celsius frees them to roll. To prove that the cars were rolling rather than sliding, Kelly and Osgood took STM images every minute and watched the cars progress. Because nanocars' axles are slightly longer than the wheelbase ­ the distance between axles ­ they could determine the way the cars were oriented and whether they moved perpendicular to the axles. In addition, Kelly's team found a way to grab the cars with an STM probe tip and pull them. Tests showed it was easier to drag the cars in the direction of wheel rotation than it was to pull them sideways. 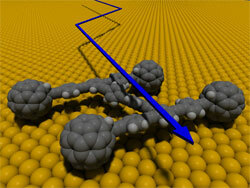 Synthesis of the nanocars also produced major challenges. Tour's research group spent almost eight years perfecting the techniques used to make them. Much of the delay involved finding a way to attach the buckyball wheels without destroying the rest of the car. Palladium was used as a catalyst in the formation of the axle and chassis, and buckyballs had a tendency to shut down the palladium reactions, so finding the right method to attach the wheels involved a good bit of trial and error. The Rice team has already followed up the nanocar work by designing a light-driven nanocar and a nanotruck that¹s capable of carrying a payload. Other members of the research team include chemistry graduate student Yasuhiro Shirai and post doctoral associate Yuming Zhao. The research was funded by the Welch Foundation, Zyvex Corporation and the National Science Foundation. Rice University is consistently ranked one of America's best teaching and research universities. It is distinguished by its: size - 2,850 undergraduates and 1,950 graduate students; selectivity - 10 applicants for each place in the freshman class; resources - an undergraduate student-to-faculty ratio of 6-to-1, and the fifth largest endowment per student among American universities; residential college system, which builds communities that are both close-knit and diverse; and collaborative culture, which crosses disciplines, integrates teaching and research, and intermingles undergraduate and graduate work. Rice's wooded campus is located in the nation's fourth largest city and on America's South Coast.